Science is not just happening with the Coral Reef Ecosystem Division’s fish survey aboard the Hi’ialakai, science is happening all the time all over the ship. Today I was fortunate enough to go on a tour of the engineering deck with the ship’s Chief Engineer, James Johnson (“JJ”), to take a look at some of the technology and machinery that keep this ship running. Engineering is so huge, it requires its very own deck. On this deck, there is the propulsion room, the shaft alley, and the control room, just to name a few. 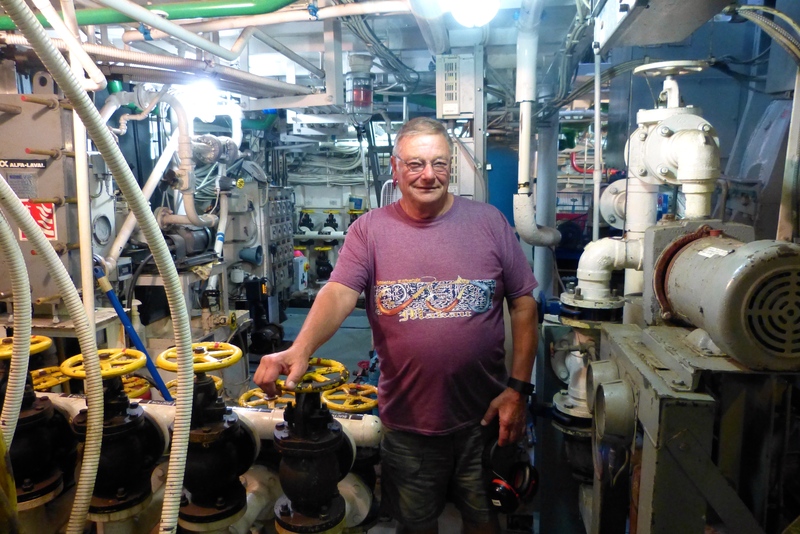 Besides the engines and rudders and propulsion equipment that keep the ship running literally, there are so many things that have to function properly on a daily basis, because life on board depends on them. We need fresh water for showers, scientist gear cleaning stations, drinking, cleaning, and cooking. We have air conditioning so the temperature is comfortable on board. The galley needs refrigeration to keep food fresh and power for cooking. There must be an efficient system for disposing of waste. There are washing machines and electric gym equipment, and a host of other things that all need to work on the ship. 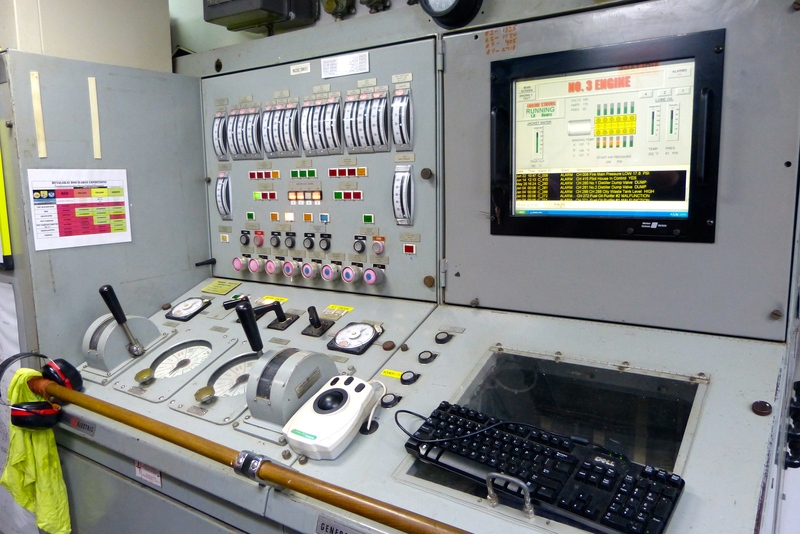 All of that takes place in the Chief Engineer’s domain. In a worst-case-scenario, the ship could be steered from engineering. One of the interesting things I learned on my tour is that the ship uses about 2,000 gallons of fresh water on a daily basis. After 10 days at sea, we have used about 20,000 gallons of fresh water all together. Where does all that fresh water come from? The ocean! The engineering deck contains a machine called the Watermaker. It uses reverse osmosis to desalinate seawater. This device is capable of producing 3,000 gallons of fresh water a day. It is pretty amazing. There is so much going on in the engineering deck, I found it a bit overwhelming. I am amazed that one person (with a small army of helpers) could know how to run all of that different equipment, and to know how to fix it all if anything goes wrong. I know JJ has had many years to develop his skills, but I am still very impressed. I have been very impressed with the professional and efficient way the Hi’ialakai is run, particularly with its attention to safety. This is all to the credit of CDR Daniel M. Simon, the commanding officer of the ship. 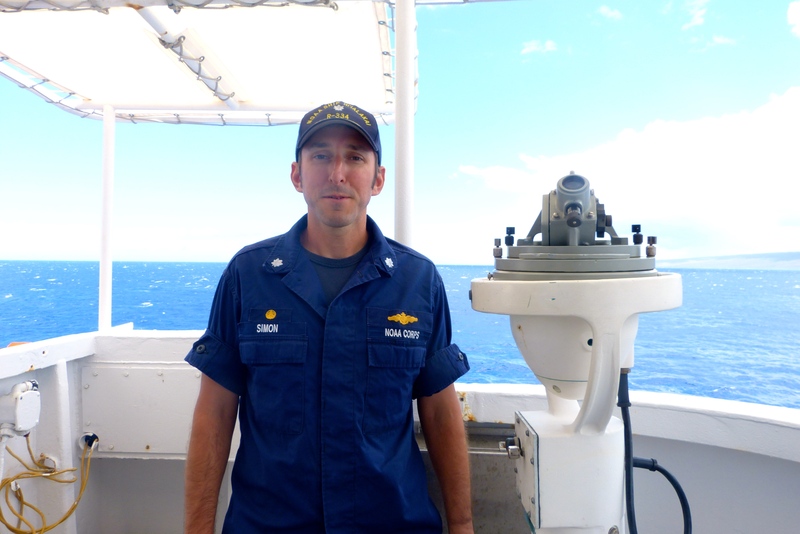 He was kind enough to take some time out of his busy schedule to sit down with me and talk about what it’s like to be a NOAA Corps officer and the captain of a NOAA ship. Overseeing the overall safety of the ship and the completion of the mission. I ensure that navigation routes are safe and take care of any issues driving the ship. I work with the chief scientists to make sure the mission is completed as safely as possible. There are two things I love most: First, the adventure of it all. We are getting to see parts of Hawaii most people never get to see. Earlier this year, we were in Samoa, and last year we had a mission in the Marianas. Second, organizing and managing everything and seeing it all come to fruition. What kind of education do you need to have this job? In order to become a NOAA Corps officer, you need a four-year college degree in math, science, or engineering. After that, you can apply to be an officer. I have so far worked for 14 years as a NOAA Corps officer. I spent time on research vessels as an ensign and as an executive officer. I worked in many different capacities in those positions and gained experience that was valuable to becoming commanding officer of the Hi’ialakai, the position they have assigned me to here. I did not always want to be the captain of a ship. I did not have any experience with the ocean before applying to NOAA Corps; it was all new to me. Even though my background was in science, it had nothing to do with a ship. I looked at it as a treasure trove of new information to learn. NOAA sent me to dive school, and I had never even snorkeled before! Do you have any advice for young people interested in your line of work? Get the education. College degrees open a lot of doors. Have an open mind, be open to learning new things, and be willing to try new things. I still learn new things every day. Love learning because it never ends. Recruiters are looking for these things: open-mindedness, love of learning, and the ability to handle yourself. Today, I got to go up to the bridge and see what the command center of the ship is like. Besides a nice view, they have a lot of special equipment up there that helps them navigate the ship and keep an eye on the small boat operations taking place on a daily basis. I learned how to plot the ship’s location on a nautical chart using both GPS coordinates and visual fixed-point references. They even let me steer the ship. 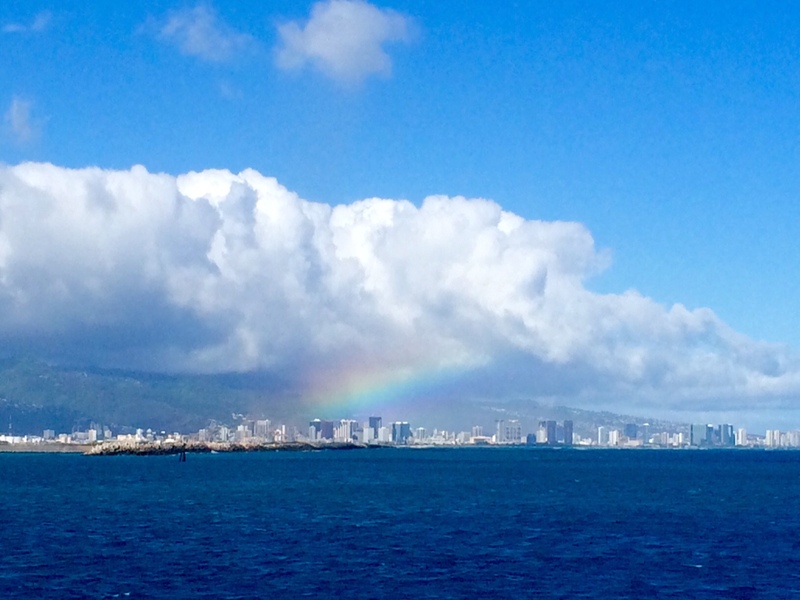 My time aboard the Hi’ialakai is quickly drawing to a close. I am very grateful for the opportunity to come aboard and be part of this mission. I learned so many new things every single day, that I have enough material for at least 20 more blogs! Unfortunately, I will be unable to write them. I would like to thank the Coral Reef Ecosystem Division and the rest of the science team conducting the mission for letting me learn about and share their very important research. I would also like to thank the crew and the officers for being friendly and making my short stay here a pleasant one, and particularly the captain for keeping us all safe. This entry was posted in 2015, NOAA Fisheries Service, NOAA Teacher at Sea, Sandra Camp and tagged Coral Reef Ecosystem, engineering deck, Hi'ialakai, reverse osmosis. Bookmark the permalink. The teacher learned new things, and she will pass along a lot of that new knowledge to others.